When it comes to industrial air compressors, weather extremes can play a crucial role in the performance of internal mechanisms. Some of the most common issues we see when repairing units are air leaks, clogged drains and dirty filtration systems. To keep some of these issues at bay, we’ve put together a lit of 8 tips to help prepare your air compressor for each season, including the coldest winters and hottest summers. When maintained properly, an air compressor can work efficiently in all types of weather, especially if the environment is suitable for the technology. With regular maintenance of your air compressor and the room it’s housed in, you can take advantage of optimal performance throughout the year, with minimal downtime. When the temps get warmer, condensation levels typically rise within an air compressor. This can be problematic on many levels, because moisture can impact the performance of pneumatic tools and the parts within an air compressor. If the drains fail and water begins to build up, it could spoil a production or cause the machine to shut down. Condensation can also cause issues for spray paint operations, especially when misty air transports aerosolized oil to the end point. Check the drains to make sure they function properly for the increasing demands placed on the compressor once temperatures spike. Make sure the water passes through without backup, and that the drains are capable of handling the increased flow of water from the air compressor. Additionally, make sure oily water isn’t released into the drain of the air compressor. The condensate should be treated before it makes its way to the drain, and the treatment system and filters within the compressor must separate the oil from the water. To ensure that oily condensate doesn’t filter into the drain, check the oil separators to ensure they’re working properly. A clean filtration system plays a huge role in increasing air compressor efficiency. As long as the air and oil are sufficiently filtered throughout a given cycle, the air compressor can be expected to produce cool air at consistent volumes with an overall smooth performance from the machine. However, if the filters are clogged with dirt, the pressure can drop, forcing the air compressor to work harder just to perform basic functions. Essentially, energy gets consumed and the parts wear faster in the process. If dirt is allowed to accumulate over several seasons, the decline in air quality could serve as a warning sign of costlier problems down the road. 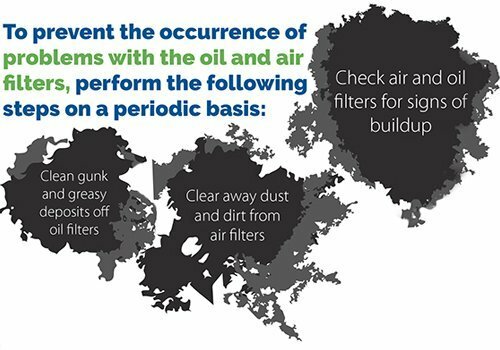 To prevent these problems from occurring in the first place, check the filters regularly and clean them out as needed. The temperature that surrounds an air compressor has a direct effect on the machine’s performance. If the surrounding air is hotter than normal due to the summer heat, it can affect the performance of pneumatic tools and machines. 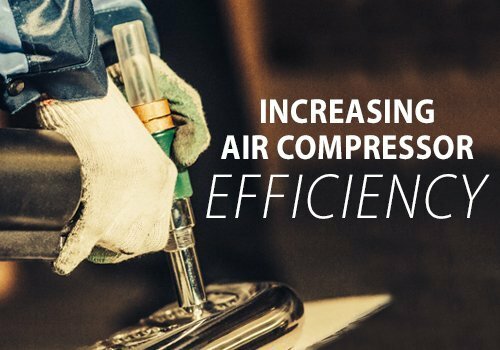 It’s crucial that the air compressor itself maintains consistent temperatures throughout the year, including those hot summer months where outdoor temps soar above 80 degrees. If the air compressor overheats, it could cause issues for the compressor itself, as well as for any attached pneumatic tools and machinery. If a compressor is used to power air blowers, for example, the quality of air that reaches the end point could be ill–suited to handle the task when the system is overheated. Air compressor maintenance is only part of what keeps the system in top shape throughout the year. In order to keep a compressor performing up to par, you also need to ensure that the compressor’s environment is maintained with prime working conditions for the machinery contained within. In any kind of work environment, the air needs to circulate properly in order to remain healthy. Even if you have an HVAC system in place that’s been specially programmed to maintain optimal temps and ambient air quality inside the room that stores your compressed air system, the HVAC unit itself could become compromised if you don’t periodically inspect it. This could degrade the quality of air within the compressor room and have a domino effect on the compressor and related tools. These problems can be prevented with routine inspections of the air vents and HVAC system. When you’re using water to cool the air system, the water itself must be cool in order for it to have the desired effect. When the weather gets warmer, the water that goes in should be even cooler. Just as with air coolers, a water–cooled air compressor needs sufficiently cool water to offset the ambient warmth during hotter months. With any machine that supplies quality air, external factors can impact the performance of the machine and the quality of air that reaches the end point. In the case of a water–cooled air compressor, the quality of compressed air can be compromised if a normally cold water supply heats up due to humid ambient temperatures. To prevent such problems from occurring, check the water supply during hotter months to make sure that the water temperature remains consistent with fall, winter and spring levels. When reviewing the environment that houses the air compressor, insulation must be maintained during the humid summer months, as well as through the frigid winter months. If temperatures that are either too hot or too cold for ideal operations leak into the facility from the outside, the affects could compromise the performance of an air compressor and lower the quality of productions. One of the most elusive problems that can occur with compressor room ventilation is the passage of air through small slivers and cracks in unexpected places. These cracks or holes could be located along the wall, ceiling or trim. Inspect these areas a few times each year and patch up any holes or cracks that pop up. In an insulated room, the air quality can be compromised a number of overlooked factors. For example, if there are small gaps around a door when it’s shut, air will still pass between the door frame no matter how tightly it’s locked. Same thing goes for gaps around a window — no matter how tiny they might be, they can still cause indoor temperatures to be compromised with slivers of airflow from the outside. To prevent these factors from compromising the air quality in your compressor room, apply weather stripping as needed. Regardless of the season or temperatures outside, air leaks are the ultimate enemy of a compressed air system. An air compressor could have a perfectly functioning filtration system and be free of condensate and traveling oil, yet still lag in performance if air leaks are present at any point between the machine itself and the tools at the end of the pipes. When air leaks form along a compressed air system, tool performance weakens and operations become less efficient. If an operator is unaware of the problem source, the first solution that often comes to mind is to simply crank up the pressure on the system in order to compensate for the lagging power. This, in turn, leads to increased wear and tear on the internal mechanisms of an air compressor. 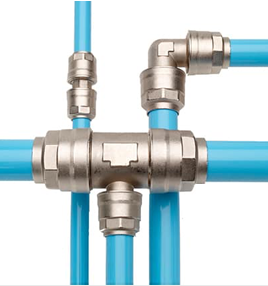 Simply put, there’s nothing to be gained from leaks in a compressed air system. 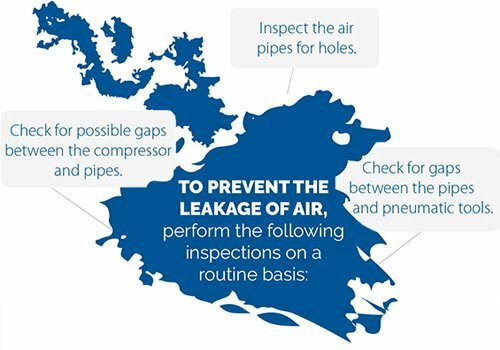 The problems associated with leaks are easier to spot and remedy, or prevent altogether, with routine inspections along all the parts that transport air from the compressor to the end tools. When summer temps are at their peak, ambient air contains infinitely more water than the cooler months of fall, winter and spring. For obvious reasons, this can be troubling for compressed air systems if maintenance protocols aren’t enforced before the temps rise. On the flip side, freezing temperatures can also be troubling for a compressed air system, particularly for applications that rely on even–tempered ambient settings. That’s why weatherization of your air compressor should be thought of as a year–round concern with maintenance undertaken every six months, at minimum, preferably in late spring and fall. 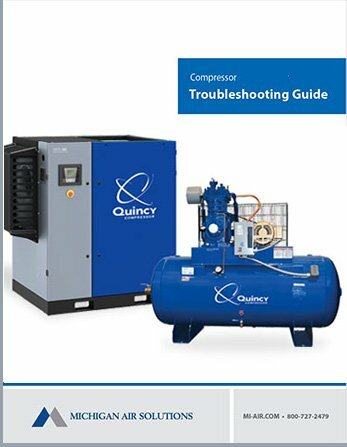 When it comes to industrial air compressor needs, we recommend Quincy Compressor, as their systems have the power to work at maximum efficiency through every season. Quincy produces air compressors that drive a vast range of vital year–round operations, including industrial, manufacturing, food packaging, construction and auto assembly. At Michigan Air we sell new and used air compressors, repair existing units, and can assist in increasing air compressor efficiency throughout the year.